Published: Feb. 19, 2015 at 09:33 a.m. Updated: March 2, 2015 at 05:48 p.m.
With the offseason officially underway, Around The NFL will examine what's next for all 32 teams. The series continues with the Detroit Lions. Both trenches could be in for an overhaul. The dominant Detroit defensive line has six free agents among them, including first-round picks Ndamukong Suh and Nick Fairley. Both could easily be gone. Depth could be in danger of dissipating as well. Edge rusher George Johnson -- coming off an impressive season -- hits the market, as does defensive tackle C.J. Mosley, who filled in superbly for Fairley. The offensive line already has one change with center Travis Swanson taking over. Depending on how the draft unfolds most of the line could be shifting. There is a chance that right guard Larry Warford could be the only starter playing the same position after the unit struggled in 2014. The Lions already made one major move on offense by releasing running back Reggie Bush. » DT Ndamukong Suh: The biggest fish in the free-agent pond. The Lions are optimistic they can keep Suh. However, they didn't franchise tag their star player. Suh said his agent will decide where he plays. So it all comes down to money, which Detroit doesn't have a ton of available at the moment. General manager Martin Mayhew's hands might be turning to sawdust as he squeezes them, praying the salary cap skyrockets above expected norms to help dig him out of this self-inflicted situation. » DT Nick Fairley: If Suh walks, Fairley could be brought back at a short-term, mid-level deal following a knee injury. If Suh returns it's likely that Fairley will find another dancing partner. » CB Rashean Mathis: The 34-year-old has been a consistent, stable force for the Lions' back end for the past two seasons. In 2014 he finished ranked the No. 12 overall corner by Pro Football Focus, doesn't miss snaps and can fend off bigger receivers. » Stephen Tulloch, Jason Jones: The two veterans play important roles, but the Lions' ability to clear $3.2 million (Tulloch) and $3.1 million (Jones) by cutting them will be of higher significance to a team pawing for cap space. Tulloch specifically will be hard for Detroit to lose from a reliability and leadership standpoint. However, after playing almost all of 2014 without the linebacker the Lions might be fine moving forward with cheaper options. » Calvin Johnson: No. No. No. Megatron isn't going anywhere this season. (You can sit back down, Detroit.) But we should start to look at his contract in the near future. His $20.5 million cap number in 2015 is part of what will make retaining Suh a difficult proposition. Converting a portion of his $12.5 million base salary into a bonus could elevate some of the problem this year, but would make his cap figures in 2016 ($24 million) and 2017 ($21 million) even more untenable than they already are. Johnson said he would help the Lions try and keep Suh. Let's see if he puts his money where his mouth is -- not many can or do. Defensive linemen. Defensive linemen. Defensive linemen. Even if Suh returns, defensive linemen. The Lions will need to add a left guard and likely another offensive tackle in the coming months. Corner has remained a need in Detroit since before Mark Wahlberg was Marky Mark. 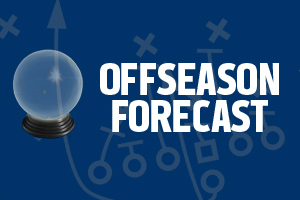 The crystal ball is engulfed by the Suh question.